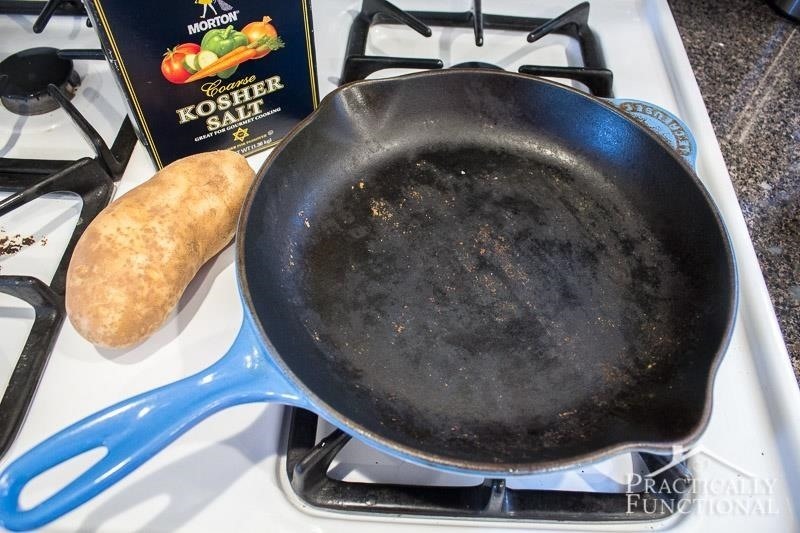 Onion scrubs, salt and olive oil blends, a baking soda slurry... despite the many methods already out there to clean your (old or brand-new) cast iron cookware, there's one you may not have considered: using a potato. According to PureWow, half of a raw potato can get cast iron skillets clean—and all you need, along with the potato, is a little salt and a little oil. 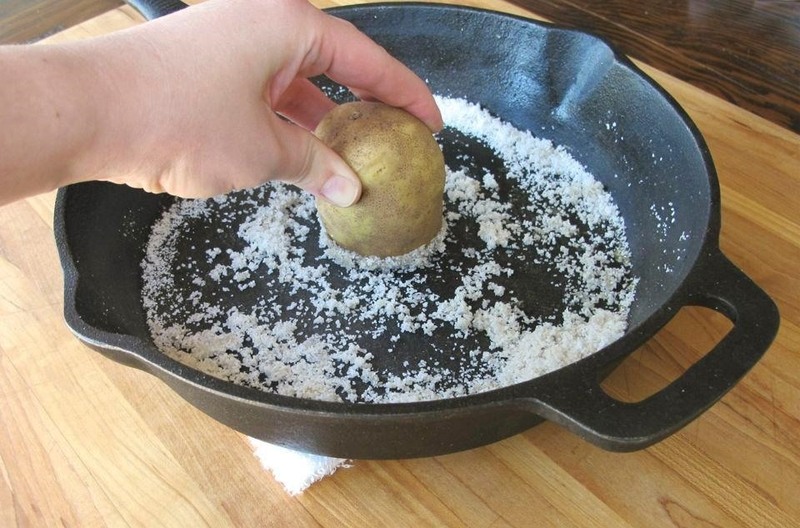 It's pretty common knowledge that coarse salt works well as a gentle scrubber for cast iron cookware, but is the potato necessary? Tori of ToriAvey.com says that the moisture from the cut end of the raw potato, when worked into the salt, creates a scrub that works well when removing debris from the pan. And, on a more practical level, a potato is much easier to grip and scrub with than using your bare hands or a washcloth. Begin by tossing a handful of salt into the cast iron pan in question. Slice a potato in half and, using the exposed raw end against the cast iron, start scrubbing in circles. Keep circling the potato around the skillet until all of the leftover bits and pieces of your last cooking endeavor are no longer stuck to your pan. Rinse all of the salt off, then thoroughly dry your cast iron. If your seasoning is still intact, simply rub a thin coating of oil onto the surface and store. However, if you need to re-season your pan, we recommend using this method using flaxseed oil, as it's proven to be the best way to season a cast iron out there. Potatoes Clean Rusty Pans, Too! Stuck with cast iron that's facing the more dire problem of rust? Go ahead and grab a potato for that task, too. As The Kitchn reports, a similar process can remove rust spots—just swap the salt out with baking soda and scrub away until the rust disappears. Potatoes excel at removing rust from cast iron pans because they contain oxalic acid, a non-toxic acid which forms compounds with the iron ions in rust. Pairing potatoes with baking soda only makes this rust-removing trick even more potent. Cast irons, however you choose to use them, may seem like a lot of work if you've never owned one before. But these nifty potato tricks will go a long way in helping you maintain your cookware with a lot less fuss—and with non-abrasive, non-toxic, everyday ingredients.